In June, PETA employees were arrested and charged with 31 counts of animal cruelty for killing puppies and throwing them in a dumpster. You won't believe what the morons at PETA have done now. Not content with routinely slaughtering animals by the thousands, now they've made a video that equates Blacks with common farm animals. I hope that Al Sharpton or Jesse Jackson is aware of this video. It's an abomination, but, coming from PETA, not surprising. THE PETA ads did misfire and have caused a lot of noise. However, I truly do not believe that PETA meant to offend anyone. Human life is the most precious of life. What has happened to black people with the slave trade, slavery, and colonization in Africa is horrific and on its face value does not compare with animal suffering. And surely black people are fully human beings and not animals. However, it is true that there is a point of connection between the mistreatment of animals, the earth and plant life, and human beings mistreatment of other human beings. How we care for those who are “lesser” than us in the life hierarchy often predicts how we will care about other life forms. If you look closely at white male dominated racism, one will see how this tyranny has not only injured and murdered people; but look at how the earth is abused; and how so many animals have been killed for sport and some life forms killed to the point of extinction. There is a thread that sews together all of this hatred, disrespect, and pain. 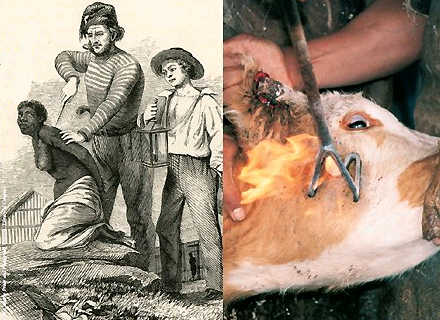 PETA was simply attempting to illustrate the continuum of pain and exploitation of all living beings on this planet. Obviously, for many people PETA failed at the analogy that they were trying to make. But again, I do not believe that PETA purposely intended to offend black people. I wish that for less media driven issues like hunger in Africa, the epidemic of HIV/AIDS both among black Americans and in Africa, and the crisis of black people being incarcerated at record levels in America received the same energy and response from the black community. It just seems like the more complex issues that require thought and organization we shy away from, while almost wanting and seeking obvious blunders like the PETA campaign.